A stalagmite from an Alpine cave may indicate that global warming is not as unusual as many think. Deposits laid down in the stalagmite have enabled a European team to probe past climates confirming a Medieval Warm Period between AD 800 and 1300. The warm spell is also indicated in some studies of tree-rings, ice-cores and coral reef growth records. Writing in Earth and Planetary Science Letters the researchers suggest that global warming is a natural process. Other scientists, however, say phenomena such as the Medieval Warm Period become less significant when broad sets of so-called "proxy data" are calibrated and synthesised to give a truly global picture - not just regional ones. When this is done, they argue, the warming witnessed in the past few decades appears to be very unnatural. The latest research was performed by Augusto Mangini and Peter Verdes, of the Heidelberg Academy of Sciences, Germany, and Christop Spötl, of the Institute for Geology and Palaeontology, at the University of Innsbruck, Austria. SPA-12 is a 20cm long stalagmite recovered from Spannagel cave in the Central Alps, a remote part of an extensive high-altitude complex of caves extending for at least 10km. 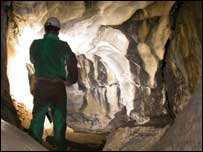 At an altitude of almost 2,500m the conditions inside the cave have remained relatively constant for possibly the past 5,000 years and certainly the past 2,000 years. Any changes there have been, the researchers believe, due to long-term changes in climate. Several factors enabled the team to use SPA-12 to reconstruct the Alpine climate over the past two millennia. For one, the relatively high radioactive uranium content of the mineral-rich liquid dripping from the roof to form the stalagmite makes it possible to date the time at which the various layers were laid down. In addition, the stable environment in which SPA-12 has grown makes it relatively straightforward to relate its isotopic composition to the temperature at which various parts of the stalagmite formed. 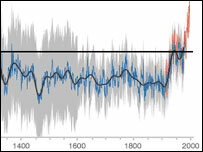 SPA-12 also shows evidence of the so-called "Little Ice Age", a temperature dip between roughly 1400 and 1850 when there is complimentary evidence from tree-rings and glacier advances that at least Northern Europe chilled a little. The long-term changes in temperature as revealed by SPA-12 are at odds with the temperature change profile adopted by the Intergovernmental Panel on Climate Change (IPCC). The IPCC temperature curve only shows small variations during the last 1,800 years with an abrupt temperature increase after 1860 - the so-called "hockey stick" - which is generally ascribed to the increase of greenhouse gasses in the atmosphere. But the researchers analysing SPA-12 say that the stalagmite's temperature record is corroborated by ice-core records from Greenland and sediment deposits on the sea floor near Bermuda, both of which show evidence for a Medieval Warm Period. The implications of SPA-12 will stoke up what is already an acrimonious debate between global warming sceptics and the scientific "consensus". The latter say the hockey stick profile of recent temperature change is now evident from several studies using different raw data and methodologies. The former argue the present climate is experiencing a natural rebound and that the IPCC should abandon the hockey stick and return to its 1990 position when the existence of the Little Ice Age and the Medieval Warm Period were recognised as more significant climate events.